With a Virtual PBX Phone System you can avail the functionality of a traditional PBX without the need for buying /installing any equipment. Instead the PBX system will be maintained at the service provider’s site. You can add new features and expand the system with ease.An efficient PBX system is a compelling necessity for a company’s business communication more so for incipient businesses. Any ineffective communication system can cripple an incipient business and retard its growth.A Virtual or Hosted PBX system operates through a service provider. A Virtual PBX service provider caters to a number of companies and hence utilizes multiple PBX systems with redundant components. They have the technical personnel to provide you uninterrupted 24×7 services. With competition getting fiercer in almost all business sectors, it is critically important for a business enterprise to have an efficient communication system for it to stay and survive and grow. After studying various phone systems available in the market, it can be said without fear of contradiction that a hosted PBX virtual phone service is the best option for small and midsize business houses to optimally meet their communication needs.The hosted virtual PBX solution offers you numerous useful features compared to the old hardware based systems and more than that, it enables you to save a lot of money. Yet another huger benefit of virtual PBX system is that you need not invest in costly equipment and the maintenance and support is the responsibility of the service provider. A hosted PBX virtual phone service has a variety of features to give a more professional image for your business. The virtual PBX system is so called because all the functions of a regular PBX system are offered through a hosted server. 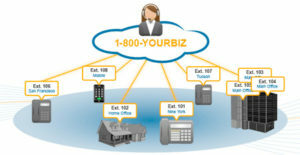 In fact, hosted PBX virtual phone system operates in the same manner as any large phone system.The virtual PBX is endowed with many features such as auto attendant, call waiting, call forwarding, fax to email, virtual receptionist, caller ID, follow me-find me, music in hold, conferencing and more. Depending on the choice selected by the caller, calls are immediately transferred to the extensions. This system expertly manages several calls arriving together and accomplishes call routing without transmitting busy tones.During the initial stages, PBX systems were very costly and unaffordable to many and were also difficult to install. Thus, it was beyond the reach of many small and midsize business enterprises. But today, thanks to the modern technology, the scenario has completely changed for the better. Now the business houses need not buy and/or maintain any PBX equipment at their premises.The entire system will be maintained by the phone service provider and all you have to pay is monthly fees. This is a great boon to businesses as there is neither initial investment for purchasing the equipment nor spending money for regular maintenance and periodic repairs. Virtual PBX phone systems with VoIP (Voice over Internet Protocol) technology are affordable and resourceful telecommunication option for small and midsize businesses. Apart from being affordable, virtual PBX phone systems are highly scalable and it not necessary for you to overbuy and keep incurring avoidable expenses. Additional extensions and features can be added at any time based on your ever growing business requirements.VoIP virtual PBX phone systems enable outbound calls to national and international sites to be made at very economic rates. If your business needs to make frequent long distance calls, you will make a huge savings. At the same time, small and midsize businesses companies can establish a virtual business presence anywhere without setting up physical offices.Some phone service companies offer a free 30 day no risk trial period without any contractual obligation. You can certainly avail this coveted offer before finalizing the service provider.To sum up, Virtual PBX is an excellent communication choice for self- employed professionals, SOHO, small and medium sized business houses. The services are provided through a hosted server and as the PBX services are used by a number of clientsHealth Fitness Articles, the services are made available at cheap monthly rates. What Is Ultrasonic Cavitation? How Does It Work?